GENEVA: Today we were subjected to persuasive arguments that although they haven't actually found it, scientists are even more sure they think they might have seen it! It of course is that heavy particle that literally imparts mass to everything, they think. 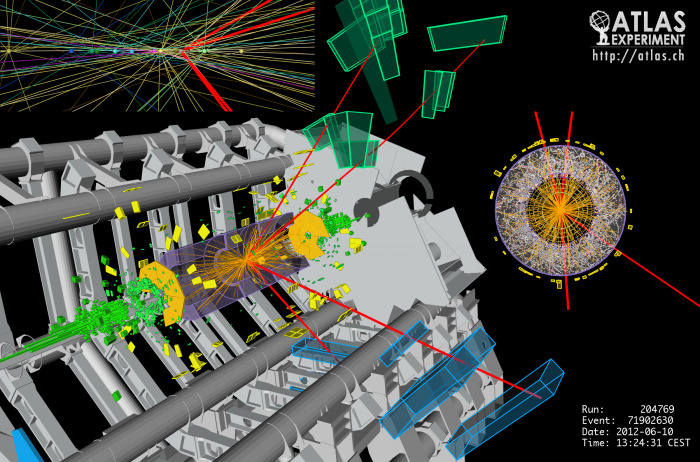 The LHC (Large Hadron Collider) was used by two different teams to achieve what are very similar results. It might be hard for some people to get excited though. They need to understand why this admittedly significant result is as important as actually "discovering" just one example of the Higgs Boson. Peter Higgs, who is the progenitor of the unlucky particle, is 83 and says he never expected to see this day. He hasn't quite yet, because it will take several months at least to find out if there is a true particle or a whole family of them. Joe Incandela and Fabiola Gianotti are the respective heads of the Large Hadron Collider detector teams called CMS and Atlas. They rated the mass of this particle at approximately 125.5 GeV (gigaelectronvolts) which is massive compared to the proton (130X smaller). The reason we never locate it exactly is because it always disintegrates into many smaller (and more discoverable) particles. Joe is honest in his assessment, "We're not certain, but I'd be willing to bet the house this turns out to be some sort of Higgs particle." So if there isn't one of these particles, what does that mean for dark matter and the answer to everything? One trillionth of a second after it all began, the universe switched on the Higgs field, which glued everything together with that delightful mass we all know about. The rest is supposition if there is no Higgs. Light in the form of photons is one of the easiest ideas to understand. Having no mass prevents it from ever slowing down, which is why the speed of light cannot be exceeded; until scientists at the LHC thought they'd done just that last year. However, particles have mass, like it or not and the Higgs Boson will eventually prove to be the answer(s) to mass, at least. Then we can all rest easy, atomically-surrounded by those quaint old electrons.